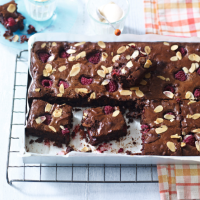 Raspberries and chocolate are a fabulous combination and are paired together in this easy recipe to make a wonderfully squidgy brownie. 1. Preheat the oven to 180ºC, gas mark 4. Line a 20 x 30cm baking tin with baking parchment. then gradually beat in the eggs until well mixed. 3. Sieve over the flour and cocoa then gently stir in. Add half the raspberries and almonds, stir in, then spoon into the prepared tin. Scatter over the remaining raspberries and almonds and bake for 30–35 minutes until just set. 4. Leave to cool in the tin for 5 minutes then turn out onto a wire rack and leave to cool completely. Cut into 20 squares and store in the fridge if not eating on the same day. ice cream for a delicious dessert. This recipe was first published in Mon Jul 14 16:19:00 BST 2014.